Patient education is one of the most important aspects of nursing. However, health care illiteracy is one of the biggest barriers to successful patient outcomes and improved knowledge base. Because nurses don’t learn everything they need to know in nursing school, continuing education is an essential tool to providing the best quality patient care. The role of the nurse is constantly expanding, and patient education is something that has truly become the nurse’s responsibility over the past decade. Understanding how patients learn is essential to effectively educating them about their condition, their disease process, their medication and other treatment regime, and ways to prevent complications from chronic disease and acute conditions. Nurses can utilize their CE to prepare them for improving their patient education techniques. Handing a patient a packet of information to read is probably the very least effective way to educate him. The average reading level in the U.S. is 8th-9th grade level. It is estimated that 90 Million Americans (3%) are health care illiterate and read below a 6th grade level. Most patient education information is written at a 10th grade level! Keep in mind too that many people are visual learners and will need to see pictures, drawings or videos and watch procedures live and then actually perform them with the guidance of their nurse. Written materials are often meaningless to them. Understanding the various learning methods is another great subject to research for relevant continuing education for nurses. Health literacy is defined by the U.S. Department of Health and Human Services as “the ability to obtain, process, and understand basic health information and services to make appropriate health decisions.” The U.S. Department of Health and Human Services presents some staggering statistics, methodologies and resources on health care illiteracy. On March 20, 2018, the American Academy of Nursing published a Call to Action for nurses to learn more and enhance health literacy in patient populations. The article was published in the AAN journal Nursing Outlook. It provides an overview and detailed information on what we have learned about health care illiteracy in the past two decades and what we need to do moving forward to reduce the effects and improve health care. Healthcare literacy is not just about being able to read and write; it’s about understanding and comprehending what you’re reading and being able to apply it to your own situation, problem solve and make informed decisions. Health care decisions are made every day including what to eat each day, whether to exercise, or smoke, or drink alcohol, or how much sleep to get. How to get and take prescribed and over the counter medications, how and when to see a physician, what their signs and symptoms might mean and when they need to report them. Understanding how medical insurance works, what to do without it and paying medical bills is integral as well. What Does Health Care Literacy Affect? Health care literacy means being able to read food labels as well as medication labels. It means understanding how to calculate individual portion levels of things such as sodium or sugar; as well as how to calculate and adjust doses of medications. How to interpret blood sugar readings and how to follow a sliding scale. It means being able to calculate costs and get the best bang for their buck for medications, treatments, and medical care. (For example, comparing drug costs at various pharmacies, or seeing an MD in her office vs going to the ER.) How to factor in other costs such as transportation and someone to watch their child while they go to an appointment. How to find after hours medical care that isn’t in an ER. The list goes on and on. Most people with low health care literacy have a huge knowledge deficit of correct information and understanding of how the body works and their own health status. This starts them off on the wrong foot and compounds their health care issues daily. Health care illiterate patients have no idea what they don’t know and are therefore handicapped in knowing where to even begin and what questions to ask. How can nurses help? What Does the Patient Know? One of the first things a nurse needs to do in educating any patient is to determine what they DO know and go from there. More often than not, this will mean starting with the very basics. And stopping often to question the patient about what he understands. Have him repeat it back in his own words. Review what he didn’t understand before moving forward. Don’t give in to the idea of time crunches! Educating patients is a major part of nursing in every field. Utilize your community when you need help. Refer the patient to outside learning opportunities and explain clearly how to access them. 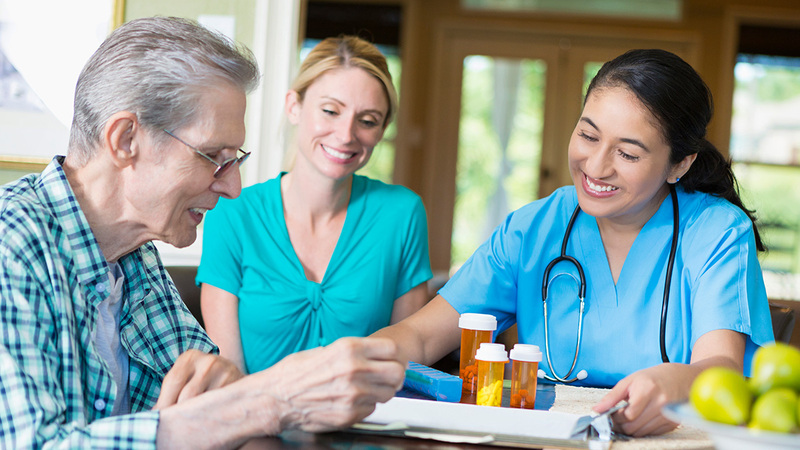 Make a referral to home health care where appropriate to continue the process and assist the patient in reaching his goals for improved health status. Continuing education for nurses plays an important role in helping to address and enhance the healthcare literacy for all patients. This in turn improves outcomes and quality of care. Keeping up to date on new discoveries in diagnostics, medications and treatments is just a start. Being able to share what you have learned along with information that is easy to read and written for them to understand is important. Being able to read it with them and explain and fill in the gaps or dispel myths will work wonders. Nurses can also use their CE opportunities to explore more about health care illiteracy and prepare them for participation in this Call to Action. Improving the quality of patient care provides improved outcomes, saves lives, and reduces the cost of health care and prevents consequences of complications.